For those who climbed Mr.FUJI! Issuance of the certificate for climbing Mt.Fuji. This is an internet service for the publication and ordering of a certificate for visit to Mt. Fuji. 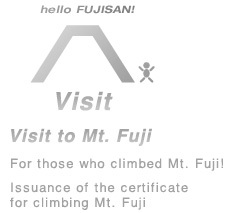 We make your certificate for visit to Mt.FUJI page, and you can share to twitter and facebook the page. 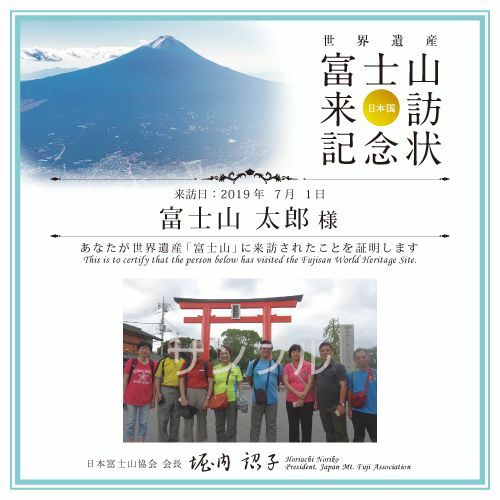 By accessing this website, noboru noboru FUJISAN and its contents, including the “Certificate for Climbing to the Summit of Mt. Fuji,” and the “Commemoration Letter for Climbing Mt. Fuji,” you agree to the terms set out by J-Bound Inc, outsourced to by Yamanashi Prefecture. Those who wish to be issued the certificates must agree to the following terms and conditions. The certificate, an official document approved by Japan Mt.Fuji Association, is a paid service for those people who reach the summit of Mt. Fuji. It is prohibited to submit things that can cause harm or injury to another, or that go against the public order. In the event a transgression is discovered, the services will be stopped, and depending on the contents, the subject matter may be reported to the authorities. The personal information written on the form (postal code, address, name, telephone number and age) will be managed by an outsourced contractor, and will be used for age verification, as well as to contact you in the case of your eligibility. Moreover, other personal information collected will be used for statistical purposes, and cannot be used to identify any individual.